Though many PlayStation fans were longing for another look at Joel and Ellie’s upcoming adventure in The Last of Us: Part II, 2017 very much belongs to another duo from the Naughty Dog pantheon: Chloe Frazer and Nadine Ross. Kicking off Sony’s E3 2017 presser yesterday evening was an extended gameplay trailer for Uncharted: The Lost Legacy (see above), the “tonally different” expansion that’s pegged for release on August 22nd. Priced at $39.99 (£29.99/€39.99), The Lost Legacy follows Chloe (Uncharted 2) and Nadine (Uncharted 4: A Thief’s End) as they journey into the depths of India’s beautiful Western Ghats mountain range in the hope of finding a long-lost artifact known as the Tusk of Ganesha. So far, so Uncharted. Set some six months after the events of A Thief’s End, we know that series hero Nathan Drake won’t feature in The Lost Legacy whatsoever – fitting, given he retired from the treasure-hunting game by the end of Uncharted 4 – and Naughty Dog has made it explicitly clear that this is an original story that’s all about Chloe and Nadine’s adventure. 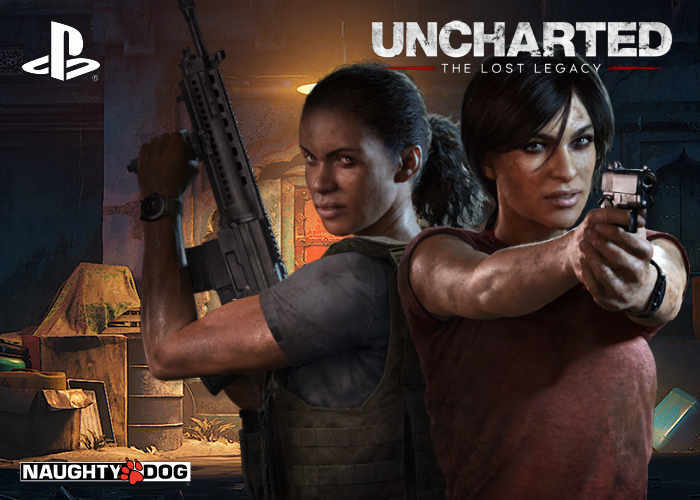 In order to recover a fabled ancient Indian artifact and keep it out of the hands of a ruthless war profiteer, Chloe Frazer must enlist the aid of renowned mercenary Nadine Ross (from Uncharted 4: A Thief’s End). Venturing deep into India’s Western Ghats mountain range, Chloe and Nadine must learn to work together to unearth the artifact and fight their way through fierce opposition to prevent the region from falling into chaos. Those who choose to pre-order The Lost Legacy through the PlayStation Store or at participating physical retailers will be entitled to a free digital copy of Jak and Daxter: The Precursor Legacy, which is due to light up PS4 later this year. Uncharted: The Lost Legacy, meanwhile, debuts on August 22nd.